The CONSTANT PHOENIX WC-135W serves as an aerial collection platform for the detection and identification of debris from nuclear weapons detonations. It is controlled by the Air Force Technical Applications Center (AFTAC) and operated by the 45th Reconnaissance Wing at Offutt Air Force Base in Nebraska. By late March 2017 there were growing concerns North Korea could be about to conduct a sixth nuclear test in the coming days. Citing U.S. officials with knowledge of the most recent intelligence from North Korea, Fox News reported that the test could happen as early as the last days of March. The Fox report said the US had seen evidence Pyongyang had finished digging new tunnels around the Punggye-ri nuclear test site, but it would still have to bring more equipment into the area for a test. Those preparations, according to another US official, prompted Washington to send a special surveillance aircraft to a base in Japan. 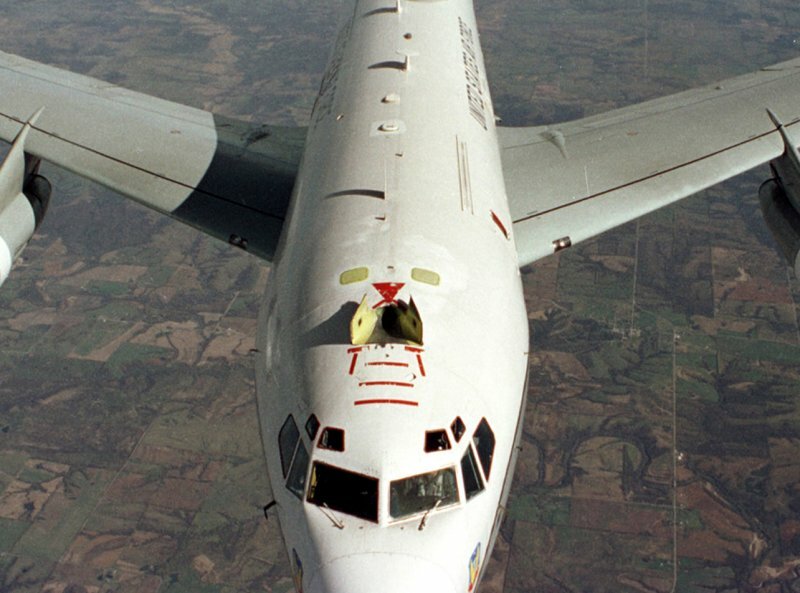 The WC-135 Constant Phoenix collects samples from the atmosphere to detect nuclear explosions, and would be used to patrol the area off the Korean peninsula in the coming days. According to South Korean defense ministry officials, the plane was deployed from a U.S. base in Okinawa to verify rumors that North Korea was going to conduct its sixth nuclear test the same day, though the rumors didn't hold up in the end. Two of the planes had reportedly arrived at the U.S.-operated Kadena Air Base on April 7th. to prepare for this kind of situationand returned there after surveying the East Sea. The surveillance craft had made their last appearance over the Korean peninsula in September of 2016, after North Korea conducted its fifth nuclear test. As the nickname suggests, the "nuke-sniffer' is equipped with a special device that enables it to collect and identify chemical elements released into the atmosphere during a nuclear test. Although the planes returned empty-handed this time, many experts, including South Korea's own foreign ministry, have long believed there is a high possibility the regime could conduct its sixth nuclear test in April. General Dwight D. Eisenhower commissioned the Constant Phoenix program on Sept. 16, 1947 when he charged the Army Air Forces with the overall responsibility for detecting atomic explosions anywhere in the world. In September 1949, a WB-29 flying between Alaska and Japan detected nuclear debris from Russia's first atomic test--an event thought not possible until mid-1950. 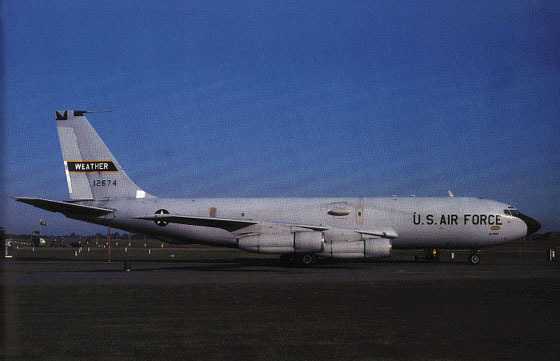 The WC-135 aircraft is a modified C-135B. The Constant Phoenix's modifications are primarily related to its on-board atmospheric collection suite, which allows the mission crew to detect radioactive "clouds" in real time. The aircraft is equipped with external flow-through devices to collect particulates on filter paper and a compressor system for whole air samples collected in holding spheres. The interior seats 33 people. The cockpit crew is from the 45th Reconnaissance Squadron at Offutt AFB, Neb., and special equipment operators are assigned to the Air Force Technical Applications Center at Patrick AFB, Fla.
Air sampling missions were routinely conducted over the Far East, Indian Ocean, Bay of Bengal, Mediterranean Sea, the Polar regions, and off the coasts of South America and Africa. The WC-135W played a major role in tracking radioactive debris from the Soviet Union's Chernobyl nuclear plant disaster. Currently the air-sampling mission supports the Limited Nuclear Test Ban Treaty of 1963, which prohibits any nation from above ground nuclear weapons testing. For many years the ten WC-135B weather reconnaissance airplanes flew global missions in support of weather analysis, nuclear detection, and scientific research. A single WC-135W [61-2667] is currently assigned to the 45th RS, 55th Wg at Offutt AFB. This mission was previously conducted by WC-135W 61-2665, which was retired to AMARC in September 1996. The WC-135W Constant Phoenix aircraft collects particulate and gaseous debris from the accessible regions of the atmosphere in support of the Limited Nuclear Test Ban Treaty of 1963. The AFTAC aircaft was used to monitor the Limited Test Ban Treaty of 1963 and was deployued in 1986 to track radioactive debris after the meltdown of the Soviet nuclear reactor at Chernobyl as well as a Chinese nuclear test in the early 1990s. A WC-135W aircraft from the 45th Reconnaissance Wing at Offutt Air Force Base in Nebraska, the only US airborne sampling platform, was deployed to south Asia after the Indian and Pakistani tests to determine the magnitude of the blasts. Air Combat Command's 82nd Reconnaissance Squadron maintains aircraft; prepares combat-ready aircrews; and analyzes, processes, and disseminates intelligence data launch in support of RC-135V/W Rivet Joint, RC-135U Combat Sent and WC-135 Constant Phoenix missions flown in the Pacific Theater. Of special value to the Pacific Command and national command authorities, information obtained is used at all levels of the Department of Defense and within other government agencies. The squadron works closely with the 390th Intelligence Squadron. In October 2002, the US WC135W plane flew to the Kadena US base in Okinawa. The plane was equipped with radioactivity detectors. The plane was sent to check for possible nuclear weapons tests by North Korea. As the Korean nuclear crisis escalated, US spy planes stepped up activities around the strategic Japanese island of Okinawa. The WC-135W plane, which helps collect and identify debris from nuclear weapons detonations, returned to Okinawa's Kadena airbase on 04 February 2003. 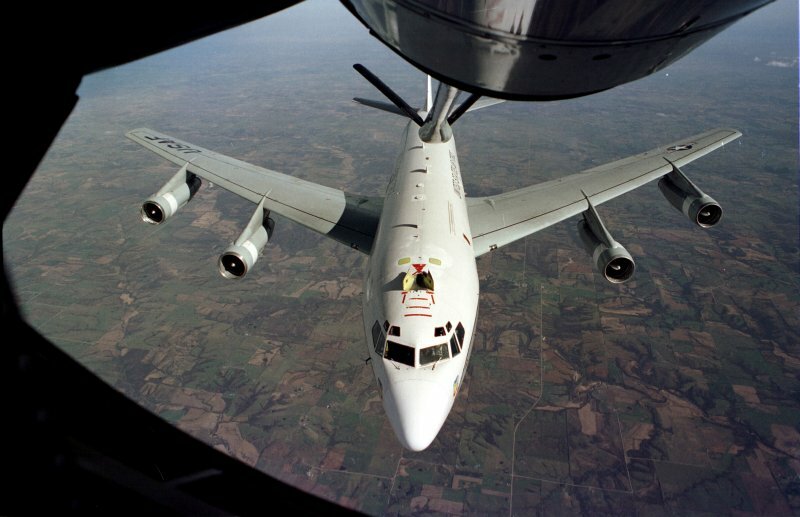 Equipped with special filters and samplers, the lone WC-135W serves primarily as an aerial detection platform. Among the many agencies that rely upon information collected by the WC-135W is the Air Force Technical Applications Center (AFTAC), which is responsible for the detection and identification of atomic explosions or their aftermath. As of late 2004 Offut AFB supported a single WC-135C [serial # 62-3582] which had flown 100 hours in 23 sorties during FY2004, and a single WC-135w which had flown 609 hours in 83 sorties during FY2004. Future upgrades called for migrating to Advanced Atmospheric Research Equipment (AARE), which will be flown on RC-135 trainer aircraft. The Advanced Atmospheric Research Equipment (AARE) program completed its Preliminary Design Review in 2002. AARE will provide a suite of modernized, computer-controlled gas- and particulate-sampling subsystems to the Air Force with an Initial Operational Capability date of October 2003. AARE will provide a unique capability to do treaty monitoring and sampling against worldwide nuclear testing activities. By 2003 Sandia was developing the Advanced Atmospheric Research Equipment (AARE) to provide the US Air Force with the ability to continue a 50-year-plus mission of monitoring foreign nuclear tests. AARE will provide a unique capability to do treaty monitoring and sampling against worldwide nuclear testing activities. The precursor to AARE, the Atmospheric Research Equipment (ARE), was the only Air Force airborne Nuclear Debris Collection and Analysis asset in service, and it was based on 30- to 40-year-old technology. AARE replaced this aging equipment with modularized systems that can be deployed on any of three designated Air Combat Command TC-135 training aircraft. The Government issued a Firm Fixed Price contract in April 2004 for the acquisition of 500 each Vessel Identification Plugs, P/N: A61412-000 with sole source manufacturer Mechanical Solutions Inc.(MSI), 8300 Corona Loop NE, Albuquerque NM 87113. The Vessel Identification Plug is a unique identification tag that identfies specific sample containers for use in the Advanced Atmospheric Research Equipment. This identification tag is an electronic identification device that is used by Whole Air Collection System to control the sample collection for each vessel. Required delivery is 100 each within 16 weeks ARO, with remaining 400 each 32 weeks ARO. In July 2006 the Cryptologic Systems Group (CPSG) announced plans to award on a sole source contract for 19 each, Valve, P/N 283-253005, to Marotta Controls, Inc, 78 Boonton Avenue, Montville NJ 07045. Marotta Controls maintains proprietary rights to this valve. This valve is a key component of the Advanced Atmospheric Research Equipment System. The proposed contract action was for supplies for which the Government intends to solicit and negotiate with only source IAW 10 USC 2304(c) as implemented by FAR 6.302-1, only one (1) responsible source. The Government intended to make an award by 14 Jul 06. On 06 October 2006 Japan's Kyodo News agency reported that a US military aircraft, equiped to detect radiation from a nuclear test, took off from southern Japan. This was believed to be part of US efforts to prepare to monitor a North Korean nuclear test.